Using a guitar capo allows you to effectively reposition the nut of your guitar up to a new fret, increasing the pitch of the open strings. Obviously you can tune the guitar down, so using a capo can be seen as tuning up from standard tuning without over stretching and breaking the strings! Vocalists often find the capo useful because it allows them to sing in a more comfortable register, yet still allow the guitarist to play those familiar, lush open chord voicings. 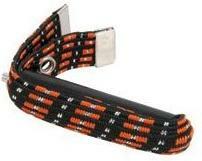 There are two main types of capo - strap and clamp. Both serve the same fundamental purpose - to press down a bar across the strings at a given fret. It's similar to when you barre your fingers across, i.e. in barre chords. As the name suggests, strap capos involve pulling the bar down by tightening a strap around the back of the neck. Simply clamps the bar down onto the strings using a spring or locking lever (by tightening a screw). These are designed to only fret one or a few strings, leaving the others open as standard. Great for alternate tunings and where you need a low bass string but higher treble strings. Whichever type of capo you use, the positioning is the same. Make sure the bar of the capo is positioned close to the fret wire. This is exactly the same principle as if you were fretting the strings with your fingers. Ensure the capo is straight, in line with the fret wire. Make sure that when attaching the capo you don't push any strings out of place. Make sure all the strings remain in equal spacing apart from each other, as they would rest naturally. Ensure the capo is tight enough by playing each string and listening for any excess buzzing. 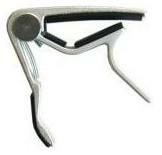 The capo will be your "base" so you need it to resonate without obstruction, just like your open strings would. Always remove the capo when putting your guitar down for longer than a few minutes. Barre and other movable chords will remain unchanged, as they do not use any open strings and you'll be using the same fret as you would without the capo. E.g. a G major barre chord will still be played at the 3rd fret, even if the capo is on the 1st or 2nd. Using a guitar capo can provide fresher chord voicings and put your songs in a different key, often giving them a completely different feel. Experiment with it and try the capo in different positions, as high as the 5th 6th 7th, even higher frets.